Cyber-Duck is a fun, dynamic and innovative agency. We must pack our unique personality and values into each paragraph! These guidelines ensure we write using a single ‘voice’ that is distinctive, unique and on-brand. Only a consistent, authentic tone can build familiarity and relationships with our key audiences. This style influences all copy, across touchpoints: from our website, social media and blogs, to campaigns, email and collateral. We use catchy, compelling statements to convey Cyber-Duck’s unique value proposition and approach. Promoting our mission in a memorable way best conveys our benefits to users! With an ISO accredited, user-centred approach, our award winning team will ensure your brand, website and marketing campaigns perform exceptionally, every time. Cyber-Duck has been trusted by key clients for 11 years. 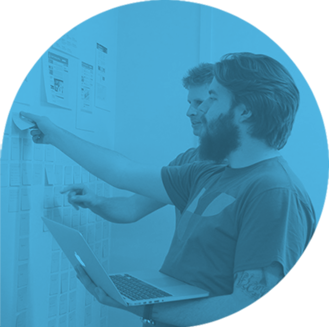 We combine agile, lean and user-centred design into an proven, accredited process. Our team delivers stellar websites, apps and campaigns within weeks! There’s no need to reinvent the wheel for each campaign! Our boilerplate is a standard, reusable description of our agency’s mission, services and accolades. Please choose from our collection below, with copy we’ve tailored for different contexts. As the Scouts say… Be Prepared! Established in 2005, Cyber-Duck is a leading digital agency that works with exciting startups and global brands such as the Bank of England, Cancer Research and Arsenal FC. As a full service digital agency, Cyber-Duck offers creative, technical and marketing services all under one roof. 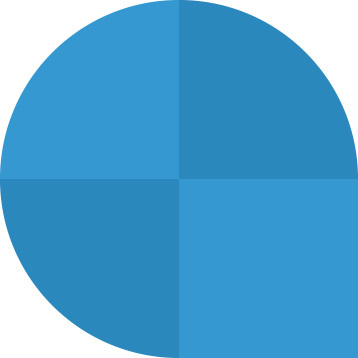 The company blends an ISO-accredited user-centred design process with lean and agile management principles, drawing on investment in creative R&D. Cyber-Duck’s research-based design process blends with high quality art direction, strategic branding and marketing research. With in-house R&D and quality assurance (QA) departments, as well as proven technological frameworks, Cyber-Duck’s projects enjoy the perfect blend of creativity, market-fit capabilities, innovative technology and security. The Cyber-Duck team has spoken as industry experts on BBC Watchdog, The Gadget Show and at many notable conferences, including SXSWi, UKTI and UX London. The agency has won some of the most sought after industry awards, including the Webby, Wirehive 100 and UX UK Awards. They were ranked as one of the top five agencies for client satisfaction by The Drum’s Independent Agencies census, as well as being listed in Deloitte’s Technology Fast 500 (EMEA). Cyber-Duck helps companies, large and small, to develop brands that inspire innovation and create exceptional user experiences at each and every customer touch point. Cyber-Duck’s user experience experts apply their ISO-accredited user centred design (UCD) process to every product, website, app or brand. Creating engaging interfaces is at the heart of what they do! Cyber-Duck develops everything from websites and apps, to software as a service (SaaS), ecommerce and backend systems. Test driven development, lean and agile principles ensures rapid, flexible delivery of the highest quality. More than just implementing campaigns, Cyber-Duck’s process combines innovative growth hacking, omni-channel marketing and user experience design. They engage your audience in meaningful conversations, crafting strategies that bring value to your business. Cyber-Duck offers lifelong support on a flexible basis. Their proactive team provides unbeatable response times, working as if they were an extension of your own internal team. The Cyber-Duck team have spoken as industry experts on BBC Watchdog and at many notable conferences, including SXSWi, UKTI, UXPA and UX London. The company has won some of the most sought after industry awards, including the Webby, Wirehive 100 and UX UK Awards. They were ranked as one of the top five agencies for client satisfaction by The Drum’s Independent Agencies census, as well as being listed in Deloitte’s Technology Fast 500 (EMEA). Cyber-Duck is a leading, full service digital agency, working with global brands like the Bank of England, Cancer Research and Arsenal FC. 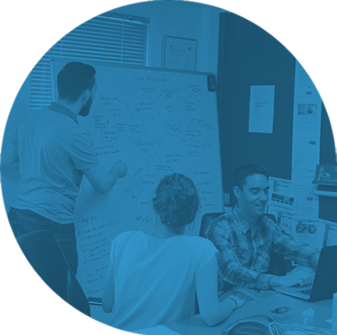 They offer creative, technical and marketing services under one roof, blending an ISO-accredited user-centred design process with lean and agile management principles. The Drum ranked Cyber-Duck as a top five independent agency for client satisfaction. Their team have spoken as experts on BBC Watchdog and many notable conferences. Cyber-Duck is a leading, full service digital agency, working with brands like the Bank of England, Cancer Research and Arsenal FC. The agency offers creative, technical and marketing services under one roof. They blend an ISO-accredited user-centred design process with lean and agile management principles, drawing on creative R&D investment. Cyber-Duck is a full service digital agency, with clients including the Bank of England, Cancer Research and Arsenal FC. The company offers creative, technical and marketing services under one roof. Cyber-Duck is a leading agency, offering creative and technical expertise for clients like the Bank of England and Cancer Research. All copy derives from the detailed version. Adapt this for longer profiles, features and collateral e.g. leaflets. Use this for very detailed web directories and press releases. For PR, please add our website’s URL in plain-text at the base. Use this for detailed web profiles, such as partnerships, directories and event sponsorship. Use this for web profiles that allow for less space, such as partnerships, directories and event sponsorship. Getting shorter… only use this for web profiles if they limit submissions to a brief word count. Our elevator pitch! Please use this for agency introductions or web profiles and pages with very limited space. All our writers unite under a distinctive ‘voice’ to craft new content. This creates a consistent, charming experience for users! Take a look at our key personality traits and advice for packing them into copy. We’re a confident bunch! Write text that’s clear, compelling and easy to understand for our key audiences. Our language must be easy to understand. We’re all short on time. Nobody enjoys wading through long-winded content stuffed with ideas. But, that doesn’t mean we should dumb down expertise! Instead, aim for clarity and simplicity. Create a compelling ‘story’ for the entire piece of content, whether it’s a blog or webpage. Then, focus on what each section should communicate and build it up. Don’t use exclusive jargon and terminology without explaining what you mean first. Avoid run-on sentences! During the lecture, Sylvain explained how Cyber-Duck embraced processes like Scrum and Danny elaborated on how user centered design (UCD) and lean techniques are used to deliver projects, products and entire businesses. During the lecture, Sylvain explained how Cyber-Duck embraced processes, such as Scrum, and Danny elaborated on how user centered design (UCD) and lean techniques are used to deliver projects, products and entire businesses. We’re all human. Our copy should be warm, welcoming and witty – matching the atmosphere of our agency family. We want to connect with people in a human way! Avoid using language that’s stiff, cold or overly formal. It simply doesn’t reflect our warm, welcoming and witty family at Cyber-Duck. Make your copy inclusive. Refer to ‘our team’, how ‘we’ do things, and appeal to readers as ‘you’ directly. Get that authenticity by providing real examples and responding quickly to queries. Make readers think! Ask the right questions, challenge assumptions and unleash your imagination. Cyber-Duck is a leading digital agency that pushes the boundaries for user experiences, technology and innovation. But that’s only possible with a huge imagination! We experiment and act on our mission. How can your writing get this across? By making readers think! Tackle creative, new topics with exciting headlines that hook readers. Ask questions, challenge assumptions and write something they wouldn’t expect. Is the pared-back minimalist style of the Google home page right for every web service? No, it isn’t. If your web service is highly original, it should provide first-time users with some clear guidance. Sometimes writing CSS can be very tedious. Craig and Jenni faced a challenge from the outset of the project that they hadn’t anticipated – finding thin plastic yellow ducks! Worried that only a small proportion of visitors make it past your home page? That may not be a bad thing. It could mean the home page tells potential customers everything they need to know. We’re open, positive and excited about our future with technology. Plug that electrifying passion into your content! Let’s plug our electrifying passion into our content! Our copy should celebrate our achievements – from awards to accreditations – without self-importance. Explain why it’s impressive and above all, what difference it will make to our audience. With confidence in our expertise, we can provide an authoritative source of digital insight. Cite reputable sources, use specific examples, include testimonials or insight from your own work. The Fastest Draw design agency – one of our competitors - has shot itself in the foot by ignoring responsive web design. At Cyber-Duck, we believe responsive web design is fast becoming absolutely essential for companies across the economy. Wearable devices are going to make life even more complicated and it will be tougher to design appealing websites. We are excited to see how consumers will use wearable devices, such as connected watches, glasses and clothes, to interact with companies in new ways. The myths have been perpetuated by influential people in the industry who have since publicly admitted they have not even used the tools at all. If we can dispel the widespread confusion about the usability, capabilities and benefits of pre-processers, these tools could provide a major productivity boost. Alongside packing in personality, we must ensure all copy produced is as perfect as possible. Get your ducks in a row with our set of 15 rules! Use these to fine-tune your phrasing and grammar to suit our audience. Active sentences communicate messages clearly and powerfully. Readers find them much easier to understand! In active sentences, the subject does the action that’s described by the verb. In contrast, passive sentences are awkward, vague and wordy. Here, the subject is acted upon by the verb. Only use these sparingly! Address the reader as 'you'. It sounds like a little change! But using ‘you’ makes readers feel like we are speaking directly to them. This encourages them to believe our ideas are relevant to them, or take action. More information on the skills we are looking for. Find out if you’re ready to become a Duck! Only write if you have something fresh and interesting to say. Don’t duplicate information between paragraphs or labour your point. Our company employs people who have both creative and technical skills. Our employees are trained in several disciplines. Our company employs people who have both creative and technical skills. Wherever possible, show, don’t tell. It’s easy to simply assert something is true. Instead, aim to provide evidence or examples that illustrate the point. Our work is highly acclaimed. We have won five major industry awards in the past three years. Use contractions, such as don’t and can’t. And look for the shortest way to say something. Be as clear and precise as possible. Don’t leave it to the reader to try and figure out what you are talking about. Content should be precise and informative, rather than vague and wishy-washy. Get straight to the point. We have expertise across multiple devices. We design websites that are easy-to-use on mobile phones, tablets and computers. These phrases can mean different things to different people, or are often mocked. Here’s an example with potential alternatives. The best would depend on the context. Avoid repetition or using derivatives of the same word in the same sentence or paragraph. It’s clumsy! We provide customers with a highly-customised service. We provide clients with a highly-customised service. Avoid using long complex sentences. In general, keep sentences short, broken up with the occasional longer sentence. Don’t use too many very short sentences in a row. It is boring for the reader. They create a stern staccato effect. You’re experiencing that now! Above all, avoid long sentences with too many sub-clauses. Readers will trip over the phrasing and miss key ideas. In 2012, which was a pivotal year for our company, we doubled our staff to 30, while moving into a purpose-built office in Elstree, which enabled us to take on seven new clients. 2012 was a pivotal year for our company. We doubled our staff to 30, moved into a purpose-built office in Elstree and won seven new clients. On our own website, please refer to Cyber-Duck as ‘we’ and ‘our’ team, agency or services. Case studies or blogs may refer to other companies. So, mention our agency’s full name so it’s clear which one is discussed. Remember companies are singular entities. Always give users a quick snapshot of what other companies do when they are first mentioned. These will either confuse readers or make them wince. Two negatives make a positive, rather than creating emphasis! Just like jargon, these exclude readers who aren’t aware of what the contraction means. This is true even if the term is well-known inside one discipline! Please expand and define the term briefly first. Then abbreviate it afterwards. Ethan Marcotte, responsible for the term Responsive Web Design (RWD), closed the talks with a very inspiring presentation about the challenges of today’s web development scenarios. Ethan Marcotte closed the talks with an inspiring presentation about today’s responsive web design (RWD) challenges. RWD is a powerful way to create mobile-friendly websites! They adapt to display best on devices of all shapes and sizes. Explain technical terms and jargon. Avoid using technical terms and jargon without explaining what you mean on first usage. Insert a one-line description of what the term means to you, and place abbreviations in brackets. This means your content will be accessible for readers of different levels, without reducing the depth of your expertise. Where possible, use the language clients and prospects are searching for. Use Google Trends to check the popularity of key terms. For example, the Internet of Things (IoT) graph shows interest has grown dramatically in the last month. We are celebrating the global Internet of Things (IoT) Day. IoT transforms everyday objects by adding network connectivity. These devices exchange data to create key features and benefits. Please write whole numbers between one and ten. Write in numerical form from 11 upwards. Most newspapers use this convention! But avoid using too many digits. Numbers above 999,999 should be written as 1 million, 1.1 million, 2 billion etc. These are a great way to break up content with digestible lists. But be consistent. Always use a colon after the introductory text and start each bullet with a capital letter. Be consistent! Use similar sentence structure throughout the list. Some bulleted lists contain short sentences that finish the introduction sentence. Ensure these ‘make sense’ when read after the introduction, and don’t use a full stop. Others contain full sentences and should retain the full stop. Consistency is the key! This dictionary covers the agency and tech-specific words that are so easily misspelled. It even demystifies the acronyms and illuminates common errors… because we’re helpful like that. Searching for a more in-depth explanation of user experience terminology and theories? There’s an app for that. Download our very own UX Companion – loved by 38,000 designers, marketers and more! Incorrect: Cyberduck, Cyber duck, CyberDuck, Cyber Duck. Contributing our unique insights into user experience, development, marketing (and more!) is an important part of our brand. We get the entire team involved. It’s an opportunity for distinctive voices and ideas to shine! But there’s a few guidelines ready to support how we write blogs. Always write in the first person for opinion pieces. Tell us what you think – it’s a chance to explore your digital passions! Web designers can be inspired by cars, fashion, architecture, consumer electronics and even spacecraft. My sense of aesthetics is influenced by classic cars. For me, the Jaguar E type is one of the most evocative cars on Britain's roads. The elongated bonnet and rumbustious curves immediately conjure up the golden age of motoring. The Web community quite rightly heaped praise onto it as an early example of a large-scale website taking a mobile first approach to design. For me, it is heartening and exciting to see such a large-scale website taking a mobile-first approach to design. The 2012 dConstruct conference website has had good reviews. The 2012 dConstruct conference website is a personal favourite here at Cyber-Duck. After writing a paragraph, try to make it tighter. Remove unnecessary words and sub-clauses. Last week I had to be in London for a client meeting. The journey took me through Liverpool Street and as I was leaving the station, I saw something that made me pause and take a deep breath. Leaving Liverpool Street station last week, I saw something that made me gasp. David Baron, also from the browser industry, was next up. He gave a detailed description of how Mozilla Firefox handles animation performance; this was useful information, though I wish he’d included more advice on tools and how we could compile data from our own animations, as this would help us to make better design decisions. I found David Baron’s detailed description of how Mozilla Firefox handles animation performance useful, but I’d like to have heard more about how to use tools, compiling data from our own animations and making better design decisions. Go for a high level of readability with short paragraphs optimised for the web. But don’t use slang! Try to relate the topic you are discussing to people's everyday lives and concerns. The technology people use to access the web is constantly changing; new web-enabled devices of all shapes and sizes are released every day, which means traditional, dedicated mobile websites are difficult to maintain. It won’t be long before our cars, our watches and even our glasses will be able to access the web and the traditional, dedicated mobile website could well be obsolete. Even with the best idea ever, a blank page can be pretty daunting. Get past that blinking cursor by flowing through our checklist. It shares tips about writing for the web and each type of blog post, from events to insights. Cyber-Duck’s Insights blog covers our agency’s news, events, insights and more. We want to provide relevant, engaging content about the fast-paced, fascinating digital landscape. Communicating our distinctive culture, process and work contributes to our readers’ decision-making process. Fresh content really adds value! But writing insight blogs also benefits our team. It’s a chance to research and reveal our passions, while developing writing skills. Marketers exploring brand strategy and web, app and product development, alongside their own craft. Project Managers from a product, marketing or technical background. They can focus on digital transformation or UX design and build. User Experience Designers interested in all aspects of their craft, from user research and testing to interaction and visual design. Developers fascinated by technologies and techniques, lean or agile processes and quality assurance. We write for the web. People read differently online. Typically, they scan web pages for information. Jakob Nielsen found many take in just 28% of the words on average. How can we make those words count? Take another look at our traits and conventions, alongside these top tips. Article length varies. Aim for 500-800 words for announcements or events, while insights can be 800+. Only exceed 1,500 with strong visuals. Top paragraph accompanies our author’s photo, separated from the rest of the content. It gives an overview of the entire post in 35-60 words. Chunk content into manageable sections that are easy to scan. Please use clear subheads, bulleted and unordered lists to convey ideas. Front-load posts. Begin with the information audiences need most and then add further detail. Short paragraphs are best. Each paragraph can cover a single idea, using three to four pithy sentences. Optimise for keywords, including phrases with good search volume to maximise visibility. But write for humans! How do we create catchy headlines? We love including bright, beautiful photography – but sadly images are heavy. Website performance is critical, so optimise each image carefully. Full colour images and photos will likely have a smaller filesize if saved as JPEG (.jpg). Flat colour graphics (like logos), B&W or transparency will often be smaller as PNG (.png). Once saved, please use TinyPNG to optimise images automatically. Our blog uses a few different image types. Please provide these to our internal editors with a first blog draft. The advice, dimensions and weight guidelines are below. Featured images are 560 x 300px, preferably under 30KB. These must be attractive because they represent articles on Insights! But avoid anything ‘busy’ because of the title overlay. Sidebar images are 420 x 300px, preferably under 30KB. These appear at the side of the main content with a short caption. One or two are needed to provide a topic overview or link related content, like services. Body images must be 820px wide, preferably under 65KB. Sprinkle these throughout to break up content, accompanied by short captions. But they must reinforce that section’s topic. Videos and slides must have a 16:9 aspect ratio. Select the ‘Slide/Video’ class in our CMS to automate this, after adding the embed code. What challenge did we solve? Can you describe our production process? Any results, press or testimonials? Can we see an example? What is the professional organisation? What accolade did we receive? How does it show our expertise? Why are we passionate about R&D? How can this product solve challenges? What and when is the event? What topics do they explore? Who was speaking from Cyber-Duck? What was the topic of their talk? How does this connect to any of our services? What were their key takeaways? Could you embed any testimonials, tweets, videos or slides? How and why did Cyber-Duck support the event? Why did you head along? What were the key themes the speakers explored? How can you apply what you learned to your work? Could you embed any tweets, videos or slides? We write about topical categories that include: user experience design, brand strategy, inbound marketing, SEO, development techniques and more. Need inspiration? Our internal marketers can provide high-level content themes, which draw on our digital strengths, interests and trends. As opinion pieces are personal and topic-driven, it’s tricky to provide a set structure. Bloggers must review our conventions, blog style and writing sections carefully. Here’s a short series of questions that can help organise thoughts into a structure. Describe a digital challenge – with the status quo, approach or changing context, for example? ‘Fix’ this problem with a new idea? Break up each ‘solution’ into sections with headlines? Use examples, stats or quotes can to support arguments? Connect the idea to one of our key services? Now you are well-versed on our slogans, writing style and conventions… it’s time to read more about our brand strategy. What’s our personality? How do our visuals communicate our brand? Read our guidelines below. Enjoy!